Denon's Blu-ray players fall into two camps – high-end behemoths and performance focused 'affordable' decks that still cost twice as much as your average model. The Denon DBP-2010 belongs to the latter, sitting below mega-pricey Denon decks like the DVD-3800BD, DBP-4010 and the awesome DVD-A1UD. So, we're hoping for plentiful features, killer performance and exquisite build. It is certainly elegant and robustly built. Available in a choice of black or silver, the casing is conservatively decorated, but the multi-layer chassis and double-layer top cover will be music to the ears of cinephiles who don't want vibrations to ruin performance. The busy fascia includes playback keys, an SD card slot and a large, informative display panel. 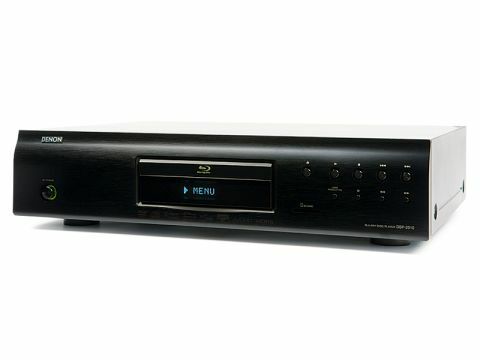 The DBP-2010 offers all the basic features you'd expect from a Blu-ray player, such as HD audio decoding, 1080/24p output and BD Live compatibility. But compared with the LG BD390 and Sony BDP-S760, the rest seems rather miserly. First up, the only way of connecting to the internet is by plugging an ugly LAN cable into the Ethernet port on the rear. There's no network function either, so if you want to play digital media you'll need to load it onto an SD card or recordable Blu-ray/DVD/CD first. Also missing is the built-in 1GB of memory for BD Live downloads, so you'll need an SD or SDHC card if you want to make the most of BD Live discs. On the plus side, DivX HD is supported on Blu-ray, DVD and CD. Of course, being a Denon deck the DBP-2010 is packed with top-quality internal components. Coming from the same parent company as the Marantz BD7004 it's no surprise that the Denon's onscreen design, remote and manual are almost identical. The operating system is easy on the eye and logically arranged into Custom and Quick menus, enabling you to tweak just the basics or delve a little deeper if required. It's also quick to respond to remote commands. A banner menu houses the picture adjustments (Contrast, Colour, Gamma Correction, Brightness, Sharpness) and a virtual surround mode. The uncluttered and clearly labelled remote is practical for most navigation and 'Glo-key' buttons do help in the dark, but the playback keys are too low for comfort. There are some causes for concern: the setup menu, for example, can't be accessed without stopping the movie first, which could make you lose your place if the chosen disc doesn't support Resume. It's also a bit sluggish at scanning and ejecting discs, but its most heinous crime is taking more than a minute to load particularly Java-heavy platters. Your reward for wading through all this operational treacle is an onslaught of gloriously sharp and vivid Blu-ray pictures. Spinning Inglourious Basterds on Blu-ray highlights its many virtues. The crispness with which it conveys the lushly textured French countryside is a wonder to behold, as is the depth and naturalism of the green bushes and trees. There's plenty more to admire as you progress through the movie: during the tense stand-off between the Basterds and the Nazi officer in the basement bar, its superb contrast setting enables you to pick out detail among the shadowy scenery; the brutal climax in the cinema is a mesmerising flurry of crisp orange flames and smoothly tracked motion, plus, the general subtlety and finesse when dealing with facial close-ups and gory effects shots makes for a totally visceral experience. As impressed as we are, however, there's nothing that particularly sets the Denon's pictures apart from cheaper players from the likes of Sony, LG or Philips. Detail levels, colour depth and dark scene definition are fantastic, but not sufficiently eye-popping enough to justify that extra £350 or so with complete confidence. For that sort of premium it should be in a completely different league. DVD playback is a different matter. The clarity and depth it brings to our copy of King Kong is spellbinding, and the lack of stepping, judder, block or mosquito noise is testament to the skills of the Anchor Bay's VRS processing. Another area where the Denon enjoys an advantage over its budget counterparts is stereo music playback. A selection of John Coltrane's jazz numbers on CD sound clean and uncoloured, while the fine frequency balance lets you appreciate the interplay between the various instruments. Internally-decoded HD audio soundtracks also sound sensational. The smooth steering, meticulous detail retrieval and rich, muscular bass effects give Inglourious Basterds' DTS HD Master Audio encoded finale the requisite punch and openness, and you get more of the same when you pass the bitstream to a good quality receiver. Weighing up the lack of exciting features and insufficiently superior picture performance against its overdraft-threatening price tag, we can only conclude that the DBP-2010 represents poor value for money. That said, if you aren't interested in bells and whistles and care passionately about sound quality, you may be able to justify the extra premium. Otherwise get more for your money elsewhere.